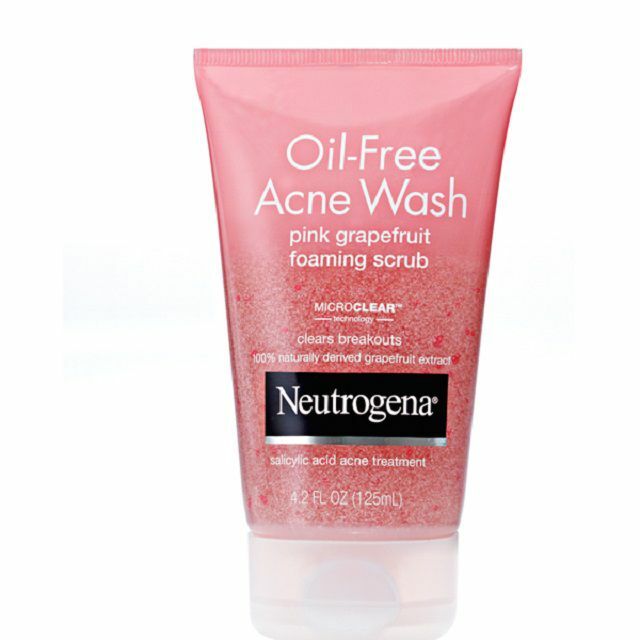 Neutrogena Oil-Free Acne Wash Pink Grapefruit Foaming Scrub is an over-the-counter acne treatment that contains salicylic acid. The scrub is used to treat mild acne and blackheads, and also to reduce oily skin. This is a dual purpose product — both a facial wash and a scrub. The foaming wash cleanses the skin while the exfoliating beads help remove dead skin cells. I'd already tried the Oil-Free Pink Grapefruit Acne Wash by Neutrogena and, to be honest, I thought the wash and this scrub were the same products in different packaging. It turns out, Neutrogena has many different products in their Pink Grapefruit line, including this foaming wash/scrub combo. I'm glad I tried it, too. I actually like this product loads better than the Pink Grapefruit wash.
Just a small amount foams up into enough to cleanse your face and neck. Seriously, a pea-sized dollop is all you need. Use much more than this and you'll have a hard time rinsing it off. Otherwise, it rinses cleanly. The gentle exfoliating beads smooth out the skin nicely and remove all traces of dirt and oil. My skin felt deeply cleaned, softened and refreshed after use. The beads aren't at all aggressive or sharp. They are so mild, in fact, that I have trouble calling this a scrub. Obviously, you don't want a product that tears up your skin every time you use it. But when I think "scrub" I imagine something with a bit more exfoliating power and this product left me wanting more. For an everyday facial wash/scrub, though, this is pretty good. While other daily use scrubs usually leave my skin feeling raw by day five, I can use this every day without any irritation at all. For regular, super gentle exfoliation, it gets a thumbs up. But people have strong feelings about this scrub – you either love it or hate it. I personally fell on the love it side. I love citrus scents, I love the color, and I love the price (regularly about $8.00, but I got mine on sale for less.) Many of my testers agree. Others, though, thought the scent was much too strong and cloying. If you're at all bothered by strong scents, steer clear of this one. Honestly, the fragrance is a bit overpowering. Some also found this product too irritating to their skin. A few felt a stinging sensation when they used it. I concede it can be drying. If your skin is at all dry or sensitive, it's probably not the best product for you. Does it clear acne? Maybe just the mildest breakouts. It can play a supporting role in your acne treatment routine though (possibly pairing it with an OTC benzoyl peroxide cream?) But ask your dermatologist first before adding it to your prescription treatments. Bottom line: if you're looking for a deep-cleansing, daily wash with just a bit of oomph to it, this is a good fit. If you're looking for the more typical, "gritty" scrub you'll probably be disappointed with this one. This product is easy to find. I got mine at Target, but it's also for sale at many grocery and drug stores, and at other big box stores like Walmart. You can also find it online. Use it as your face wash and a gentle daily exfoliant. It leaves your skin oil-free and matte. Your skin feels so soft and smooth after use. It can dry out your skin and is probably too harsh for sensitive skin types. The "scrub" is a bit lacking.